I had originally planned on putting almost a template on top of the foam board, my material, to create a sign look but I decide to instead paint through the template onto painted plywood so that would look even more like a sign. I sanded the edges a bit so that the color under the white background showed through and then I used the foam board to back the plywood and to give a sort of frame that could be used for hanging it. I really wanted to incorporate Paris because I am visiting the city this summer. I wanted to give it the antique look by doing the color underneath that would only show through when I sanded the edges. I chose turquoise which i made with blue and yellow spray paint but I was kind of apprehensive because I wasn't sure how well the spray paint would work under the acrylic or if it wouldn't have the desired affect. 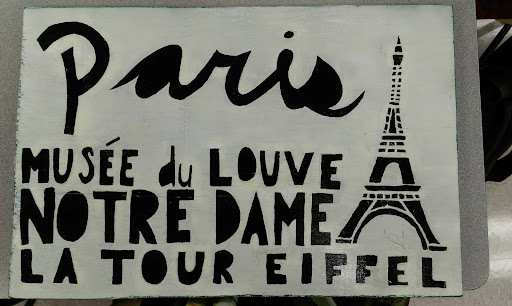 When I spray painted the letters and the Eiffel tower down onto the acrylic white paint, the images were unclean because of how some of the paint had leaked under and created splotches. I fixed this by going over the white spray paint with white acrylic and cleaned up the edges to give a straighter look.